As Halloween draws near, Throwback Thursday on WrestlingDVDNetwork.com is looking back at some of the most “evil” and “demonic” events and matches in the vault of the WWE Network. 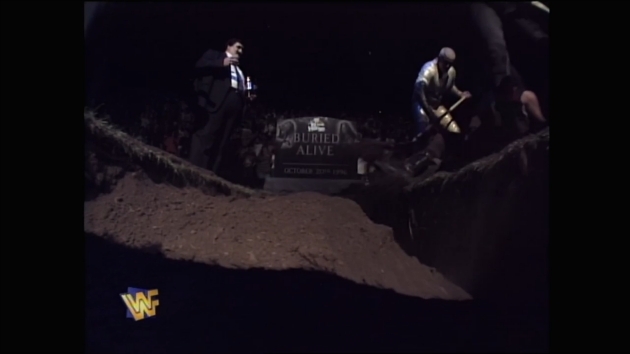 This week we’re taking another trip to 1996 and one of the most unique events ever produced by the World Wrestling Federation: In Your House 11: Buried Alive. With WCW gaining serious traction by presenting a more realistic, seemingly kayfabe-less product, the WWF had to up its game. This began in earnest at the previous month’s In Your House 10: Mind Games, profiled last month. By October 1996 the WWF was beginning to muddy the waters between reality and fiction by presenting a product closer to the mood of the country at the time. In a clear sign of what was to come, the night was headlined by one of the most violent and unusual matches in Federation history in the “Buried Alive” match. With the benefit of hindsight we travel back to twenty years ago today to see just how well this classic In Your House PPV, as well as the main event, holds up today. Context isn’t an issue. All previous RAWs and PPVs are currently available on the Network. Though the Free For All is currently unavailable on the WWE Network, it can be found online, here. 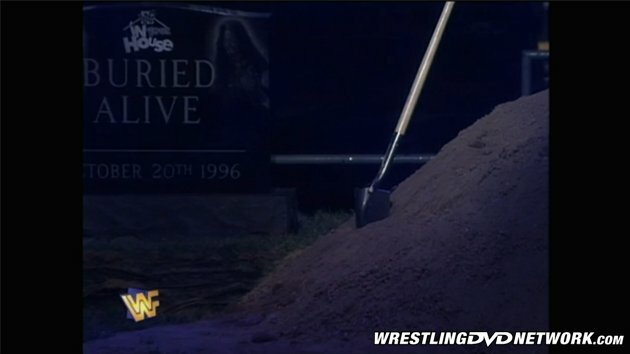 The show begins with an incredible vignette highlighting the main event “Buried Alive” match between Mankind and The Undertaker. In the arena, standing at ringside, Vince McMahon welcomes us to the show alongside Jerry Lawler and Jim Ross, who is peeved he’s the only one without a microphone. After complaining Vince hands JR the microphone from his own hand but, as JR beings to speak, Hunter Hearst Helmsley’s music hits, Vince and Lawler walk off, and the “Connecticut Blue Blood” makes his way to the ring for the opening match. This is a truly special match between two of the WWF/E’s greatest in-ring performers. Part fight, part wrestling clinic, this match got the show going on the right foot and continued to establish Steve Austin as a rising superstar in the WWF. 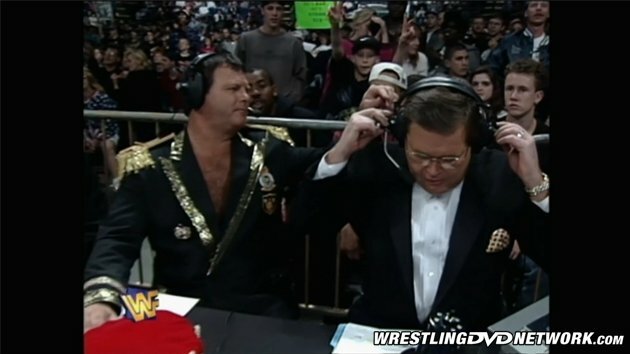 The other story takes place during the match, and that’s the continued beef between Jim Ross and Vince McMahon involving JR’s headset. The match, meanwhile, turns when Mr. Perfect comes to ringside to have a better look at Helmsley’s young valet, leading to both Austin and HHH getting into it with Perfect. After Austin and Helmsley brawl on the outside Helmsley stumbles into the ring where he is caught by a devastating Stone Cold Stunner for the pin at 14:57. Next we see a brief video package spotlighting the history of the Sunny/Smoking Gunns story with highlights of the Gunns losing the tag titles, and Sunny, the month before at IYH 10 to Owen Hart and Davey Boy Smith. After the video Dok Hendrix interviews the Gunns backstage, where Billy makes it clear he only wants the titles as a means of getting Sunny back while Bart is focused on being the first 4-time Tag Team Champions in WWF history. Billy continues to go on about Sunny as Bart grows more frustrated. The Ross/McMahon angle takes center stage early in this match. For what this match is this is a solid, better than average match. Owen and Bulldog look tremendous while Billy and Bart do their best to sell the implosion of their team. The story in this match is as basic as it gets but it’s pulled off seamlessly with Owen and Bulldog looking like world beaters and the Gunns falling apart at the seams. In the end, Bulldog breaks up the Gunns’ Sidewinder finisher allowing Owen Hart to connect with a spinning heel kick on Billy for the pin at 9:17. While the champions leave the ring Bart reads Billy the riot act. After replays and a WWF Superstar Line promo we got back to ringside where JR has left the desk and gone to the ring with a mic to openly complain about his headset not working. JR guarantees that Bret Hart will be on RAW the next night and that he, JR, was responsible for making it happen. When JR’s finished he tosses the mic to Vince at ringside and storms off to the back. Next we see footage from Free For All of Ahmed Johnson’s attack on Faarooq that took Faarooq out of the Intercontinental title match with Marc Mero later in the night. This match, a showdown between two former WCW stars, is a very entertaining wrestling match that made both stars look like a million bucks. The match goes sideways, though, when Mr. Perfect leaves the commentators table to assist Marc Mero at ringside. This brings Hunter Hearst Helmsley out who looks to get back at Perfect for taking his valet. Goldust tries to sneak up on Perfect but Perfect catches him with a right hand. Mero takes advantage, hitting the Wild Thing shooting star press for the pin at 11:38 to retain the Intercontinental title. Backstage we see Jim Ross with the fake “Razor” and “Diesel” doing an AOL Live Insider interview. Next we get a vignette highlighting the “Master of the Powerbomb” match between Sid and Vader. After Sid and Vader get to the ring Shawn Michaels comes out and gets in the face of Vader and Jim Cornette. HBK dodges Vader and goes to the commentary table as the fight begins. This “Master of the Powerbomb” match was the Starrcade ’93 main event that never was. After seeing it we can be thankful it never did. In truth this match was the most convenient way of removing Vader from the WWF title picture as HBK was tired of working with the hard-hitting “Mastodon”. The match has its few moments but is largely forgettable. 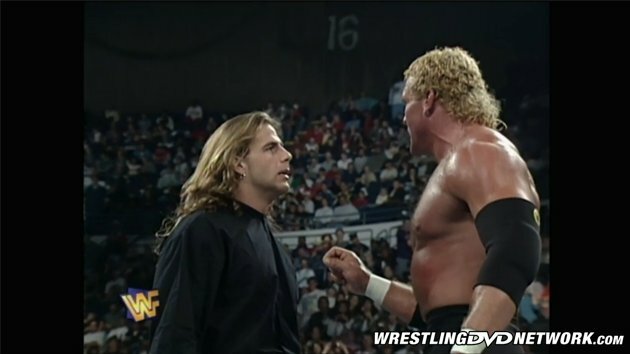 In the end, Sid ducks a Vader clothesline and hits the chokeslam for the pin at 8:00 and a shot at HBK’s WWF World title. 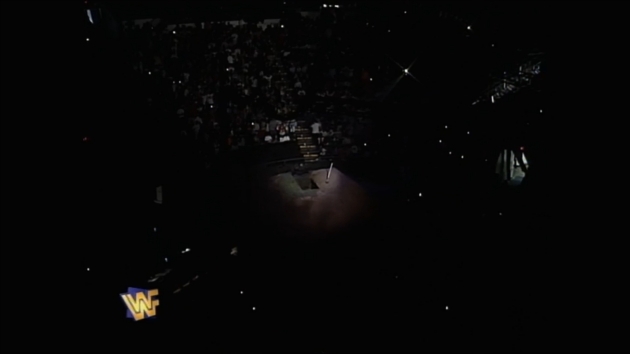 After the match HBK joins Sid in the ring and raises the big man’s arm as the pyro goes off. After a Survivor Series ’96 promo Dok Hendrix interviews Sycho Sid until Jim Ross interrupts and starts peppering Sid with questions, which Sid promptly butchers (no pun intended). Next we get a classic vignette detailing the history of the Undertaker/Mankind feud. This match is a war, as was the entirety of the Mankind/Undertaker feud of 1996. While there had been “Alley Fights”, “Hollywood Backlot Brawls”, and “Boiler Room Brawls”, there had never been anything like this match in WWF history. To this point this match was easily the most extreme kind of match the WWF had ever done. The lack of “color” doesn’t take away from the very real brutality of this match. After brawling from ring to grave and back again Undertaker dims Mankind’s running lights with ring steps to the head before hitting the tombstone piledriver. Undertaker carries Mankind to the grave where the two briefly fight before Undertaker chokeslams Mankind into the grave. Undertaker covers Mankind with enough dirt to win the match at 18:42. 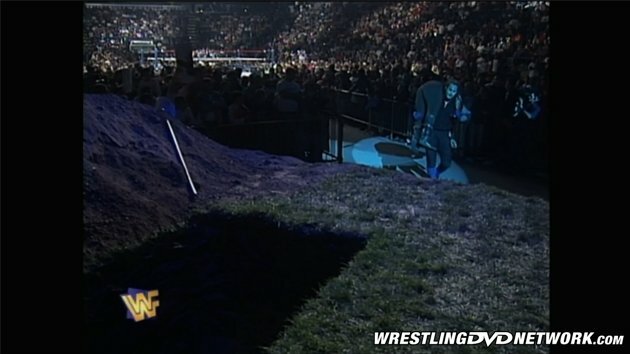 After the match Undertaker continues to shovel dirt on top of Mankind when The Executioner (Terry “Bam Bam” Gordy) brains Undertaker from behind with a shovel. Executioner jumps in the grave and pulls Mankind out. The two then dump Undertaker in the grave and begin to bury him alive. Hunter Hearst Helmsley, Justin “Hawk” Bradshaw, Goldust, and Crush come out to help and we get a fun game of “Which Wrestler Knows How To Use A Shovel” (if you picked Goldust, you win). The grave fills nearly to the top before the lights go out and thunder roars, sending the heels fleeing. 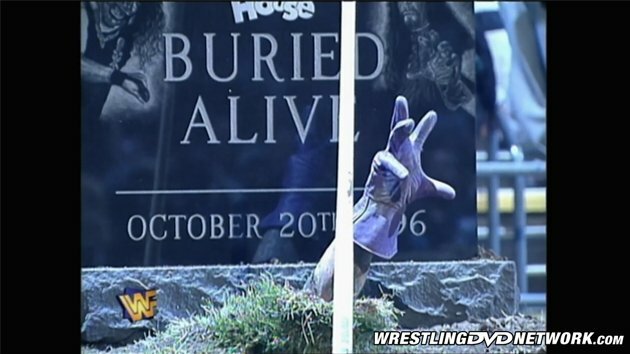 Suddenly lightening hits the headstone and Undertaker’s hand comes up through the front of the stone as the show goes dark. After years of over the top gimmicks and less than stellar wrestling, the WWF was finally beginning to turn the corner. Beyond the wrestling, the WWF was beginning to make fans guess again. Between Steve Austin’s language, the “disgruntled” JR angle, and the violence of the main event, the fog between drama and actuality was beginning to set in once more. This blurring of the line would be a key staple of the “Attitude Era” to come, an era on full display, in many ways, in this classic IYH event. That’s a wrap for this week’s TBT on WDN – thank you for reading! Wait, you aren’t already subscribed to WWE Network? Sign up, check out IYH 11, and let us know what you think below. Need more WWE Network coverage? Drop by our friends at WWENetworkNews.com. Watch every WWE PPV in history (including Hell in a Cell 2016) and 6,000 more hours of content only on WWE Network. Your first month is FREE! Click here to subscribe to WWE Network.